In any inaugural season, there will be many firsts. 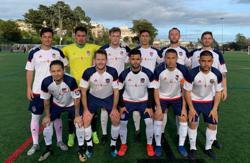 For San Ramon FC, their 3rd match of the NPSL season included the team's first penalty kick goal, first away match, and first away loss. Traveling to San Francisco to play El Farolito, the team fell behind early in the match. El Farolito scored in the opening minutes. The 1-0 score held for much of the match, with San Ramon FC missing an opportunity to equalize when El Farolito's goalkeeper saved a penalty kick attempt. Late in the 2nd half, San Ramon found the net when Jesus Morales scored from the penalty spot to even the match at 1-1. With only a few minutes remaining and the match tied, the referee's whistle blew again, sending El Farolito to the penalty spot. The home team made the most of their opportunity, scoring the game-winning goal to win by the final score of 2-1. With the result, both San Ramon FC and El Farolito hold a record of 1-2-0 on the season. San Ramon will return home for their next match on April 13 vs Sacramento Gold FC.